In 1930, New York State Supreme Court Justice Joseph Carter disappeared without a trace. Three people in particular were impacted by this mystery - Carter's wife Stella; his mistress Ritzi, a Broadway chorus girl; and his maid Maria. Their lives are thrown into turmoil as Carter's disappearance brings his infidelities and connections with notorious gangsters into the light of day. Maria faces extra scrutiny from her husband, a NYPD detective who has been assigned to the case. What do the three women really know about Carter's shady dealings and his disappearance? 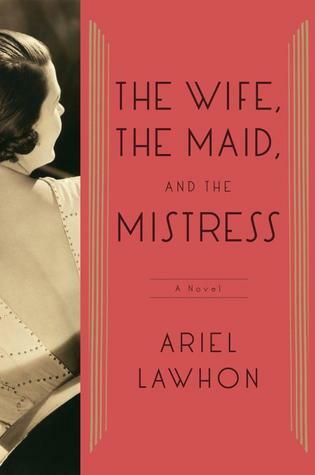 The Wife, the Maid, and the Mistress is one of those books that seems to come to life right before your eyes. As you read, you can vividly picture the world that Lawhon has meticulously created. We travel from opulent parties at lush apartments to seedy bars and back again as we traverse the streets of New York City with the characters. While this book is categorized as fiction, it is based on real events. The storytelling is so fascinating and detailed that it takes no stretch of the imagination to think that the events went just like this. This tale begins at the end. It is 39 years after Joe's disappearance and Stella Crater has come to a bar to toast her husband, just as she does every year. The difference this year is that she has invited a police detective to join her. She has decided to come clean about everything she knows. From there, we move back and forth in time and perspective as we learn what Stella, Ritzi, and Maria knew and what they experience in the wake of Joe's disappearance. The three women who carry this story are very unique. All of them have things to fear because a woman's power in the 1930s was limited. Without the direction and protection of a man, things could become dangerous very quickly especially when each of them has a connection to mobster Owney Madden. Stella fears she will become destitute without a husband to support her. Ritzi worries that she knows too much about the fate of Joe Carter and that her fate may match his. Maria sees her personal and professional lives colliding as her husband investigates the disappearance of her boss. Each one is strong and determined in their own way and I loved reading about each of them. The Wife. the Maid, and the Mistress has everything that fans of historical fiction could want. Lawhon easily transports readers into 1930s New York amid the heights of luxury and the back alleys of mobsters and chorus girls. Nuanced and fascinating characters guide the reader through the twists and turns of a mystery that will keep you turning pages late into the night until you get to the biggest twist of them all. Thanks for the review! I've had my eye on this one, specifically for my book club. We love historical reads. Every historical fiction book we've read has been a hit. I love the idea of the three women, so different from each other, caught up in a single story. And the setting! Such a great time period. I don't know if I'll get around to reading this soonly, but it's definitely going on my list. :) Thanks for the review!